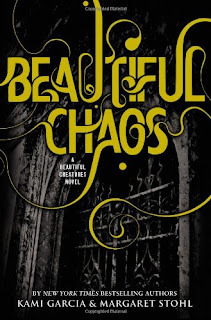 Beautiful Chaos is the third book in The Caster Chronicles. 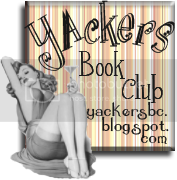 If you have not read Beautiful Creatures or Beautiful Darkness then this review WILL contain spoilers. You have been warned. The world is broken. By claiming herself at the end of Beautiful Darkness, Lena has split not only her light and dark aspects but also rendered the universe unable to function. Darkness seeps from every corner, choosing its epicentre as Gatlin. Life for Ethan and Lena is irrevocably changed. Ethan, in particular, is struggling with events. Nightmares plague his sleep and creep into his waking world, Amma mutters and lies, his father writes about an Eighteenth Moon and he is barely able to touch Lena any longer. Add to this apocalyptic weather, a much changed Link, an ex-siren struggling with her mortality as well as the crazed prophecies of Abraham and his leech, Hunting and the scene is set for the end of the world as we know it. Ethan is a character much changed by events. While he continues to cling to the life he knew he is more than aware that Lena’s actions and his own destiny as a Wayward are leading him towards an uncertain and sinister future. He’s grown up a lot and is far surer of his actions than in the previous two books. While he spends much of this book keeping difficult secrets as the narrative progresses he moves towards his somewhat inevitable decision believably, bravely and with not a little difficulty. He continues to be one of the stronger male protagonists in YA and his bleaker moments can be very moving. Lena is a harder character to like. While her behaviour in Beautiful Darkness may have been explained away, her dismissive attitude towards it is more than a little irritating. In particular, her attitude towards Liv is infuriating, hypocritical and unfair. Throughout the series, Lena has had a tendency to navel-gaze and she doesn’t appear to be growing out of it any time soon, spending much of Beautiful Chaos bemoaning her actions in an awfully emo sort of way. Her saving grace is that Ethan adores her and often she is a character made likable only by the believability of his love. 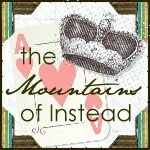 As with the previous books, other characters are beautifully written in Beautiful Chaos. Link, as Linkubus, is as charmingly puppy-like as ever (albeit in a slightly scarier way); Ridley is as frighteningly unhinged; Macon as charming and Abraham as terrifying. Beautiful Chaos also gives readers insight into Seraphine’s past, which is fairly interesting (if not a little predictable) and grants a closer look at the mysteriously wicked John Breed – with strange consequences. The Sisters shine once more, this time with added pathos and Amma continues to by the lynch pin of the series, to heartbreaking affect. Beautiful Chaos as a whole is far darker than the previous titles in The Caster Chronicles. Having carefully woven together a complex mythology, Garcia and Stohl to some extent delight in destroying the world they have created. As the story progresses it becomes clear that previous portents of doom have not been exaggerated and it is hard to imagine things ending at all happily. As with previous instalments, Gatlin itself is central to the storyline and both it and its inhabitants are used to great dramatic effect. The writing is at times extremely lyrical while at others suitably sparse. There are scenes that are tremendously moving juxtaposed against those that are darkly frightening.Particularly successful are the set pieces involving an increasingly insane Ridley and those between Ethan and his Aunt Prue. Special mention must also go to the scene involving Ethan and the lens of a video camera – chilling in the extreme. The Caster Chronicles are all long, detailed stories and readers may find it necessary to return to Beautiful Chaos (even, perhaps, Beautiful Creatures) to remind themselves of the world that swirls confusingly around Ethan and Lena – certainly, reading these titles again would be no hardship. 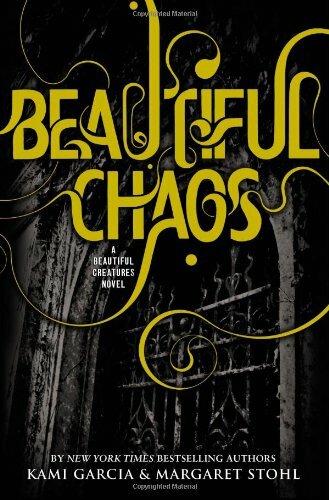 However, regardless of any re-reading, Beautiful Chaos is a thrilling roller-coaster of a story, murky with the shadows of a difficult destiny and haunted by the superstitions of the Deep South leading, one assumes, to a stunning finale in 2012.